An extraterrestrial comes to earth and takes the form of a widow's deceased husband and asks for a ride to Arizona so he can return home. "Starman" is not a bloody slasher, nor does it involve vampires, sentient cars, or ghosts on Mars, so it doesn't seem like the kind of movie famed horror director John Carpenter would helm. It turns out, Carpenter has a knack for interstellar romance dramas, too. This film is written by Bruce A. Evans and Raynold Gideon, who penned the screenplays for "Stand By Me" and the underappreciated "Mr. Brooks." This story begins in 1977 when a probe is sent into outer space with a message for all aliens of the universe inviting them cordially to planet earth. Years later, a woman named Jenny Hayden (Karen Allen) has just become widowed and is understandably having a lot of trouble coping with the sudden death of her husband Scott (Jeff Bridges). One night while watching home movies, Jenny is bewildered, confused, and frightened when an alien being that has been shot down by the U.S. government takes the form of her recently deceased husband right in front of her eyes. After being kidnapped at gunpoint by this being, it demands a ride to Arizona where it is supposed to meet up with the rest of his alien race in thee days. 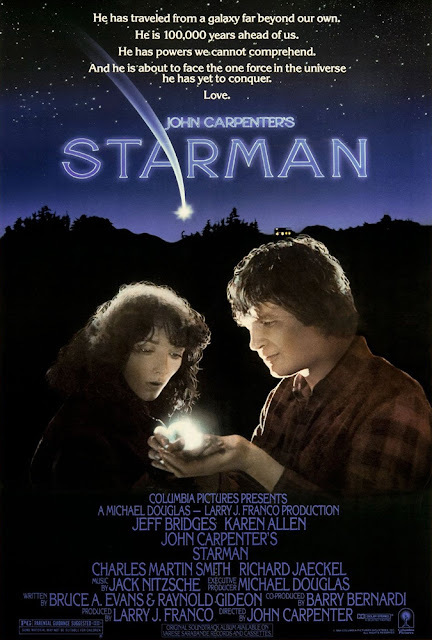 Despite her early pleas, anger, and eventual complacency, Jenny and this Scott look-alike Starman (Jeff Bridges) are about to embark on a journey they will never forget as they are chased across the country by government agents trying to track down this alien. We have loved many of John Carpenter's films in the past, including "Halloween," "Christine," and "Big Trouble in Little China," but not all of his movies work for us ("Ghosts of Mars" was a painful viewing experience). So, how will the horror iconic fare in the sci-fi romance genre? Very well, as it turns out. We absolutely loved "Starman." The main reason it works so well with as many moving parts as it has is because of Jeff Bridges and Karen Allen. Talk about terrific chemistry! As the titular Starman, Jeff Bridges brings a sense of childlike wonder, hilarious obliviousness, and deep affection together into one spectacular performance. Any other actor in this role would have been too intimidating or too hammy, but Bridges is the perfect balance of silly, serious and sweet. Each time Starman picks up on an unfamiliar colloquialism, traffic law, or mannerism, watching him implement what he has learned in real life is a laugh riot. We laughed so much while watching this, thanks in large part to Bridges' brilliant comedic timing and Evans and Gideons' well-balanced script that is neither too cheesy nor too serious. We were not surprised to learn Bridges got nominated for an Oscar for Best Supporting Actor for his efforts here as it is one of his career-best performances. Equally wonderful is Karen Allen as Jenny, who conveys such pain and sorrow as a recently widowed woman who has lost her place in the world without her husband. Initially hostile towards Starman (and rightfully so, he kidnapped her! ), Jenny must navigate her circumstances as she learns to accept that this being is peaceful and just wants the opportunity to make it to Arizona for a chance to live. The more time they share together, the more they understand one another and grow to accept each other. Jenny's anger eventually melts away into tenderness and joy, and again, why wouldn't it, the alien looks just like her husband! Part of us wondered....does he also make love like her husband did?!!?? Okay, that question is for another time. Speaking of this, *ahem* more intimate, loving moment (you mean coitus? ), this is our biggest complaint about the movie as a whole. We know that Jenny's entire life has been thrown into a whirlwind of change because of Scott's death, but the aftermath of her love scene with Starman is enough to make you want to barf. We know, we know, it's what she wanted, but it made us roll our eyes a little bit...okay, a lotta bit. 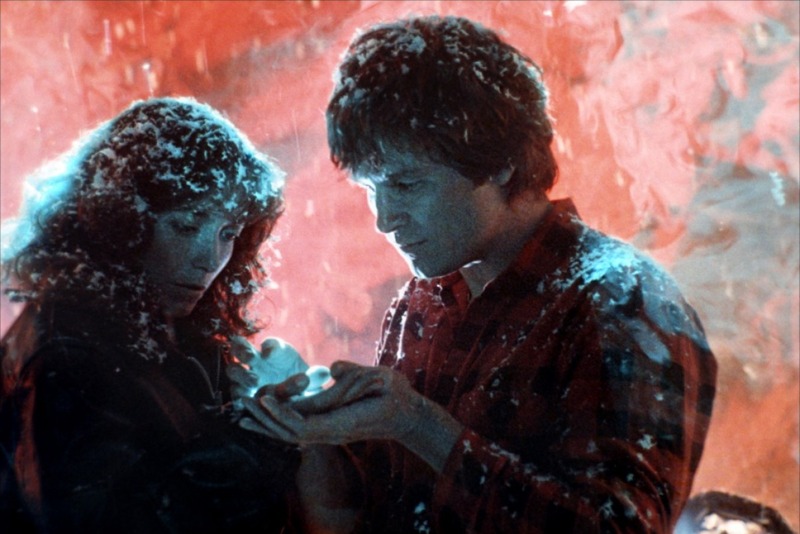 John Carpenter's expert direction helps makes "Starman" is one of his best films, in our opinion. It is an unorthodox science fiction romantic drama with a lot of heart, many thrilling moments of chase sequences, and some quirky scenes involving gambling in Las Vegas, deer resurrection, and train rides, but damn it, it all works out in the end. We had a blast watching it. It has stood the test of time when it comes to its story, its special effects, and its romance aspect. I always remember my grandma talking about how much she loved this one, so watching it made me feel a little closer to her in some small way.